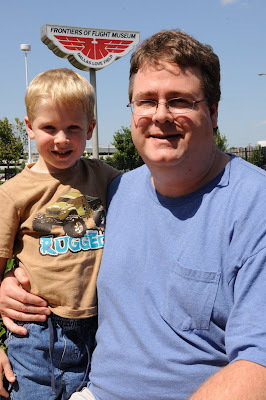 We visited the Frontiers of Flight Museum in Dallas today. They have two "Beat The Heat" events this month. Today's special was watching R/C plane demonstrations. The next event is on August 22nd which is open cockpit day! 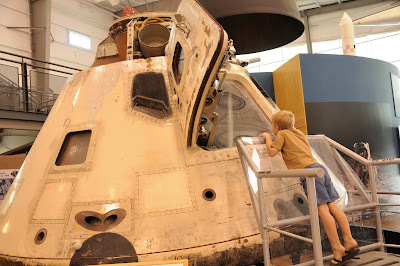 We got to look at the Apollo 7 Command Module. 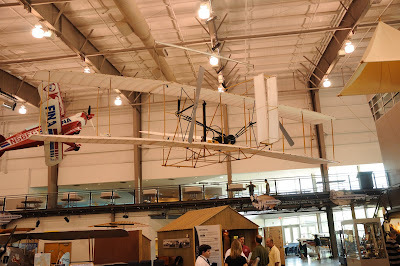 We saw a replica of the Wright Brothers' plane. 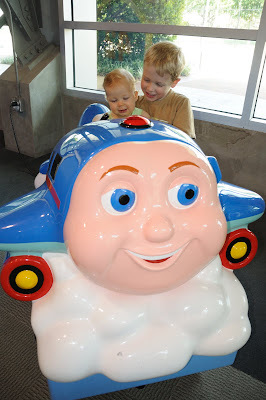 Nicholas couldn't believe this was a plane that actually flew. 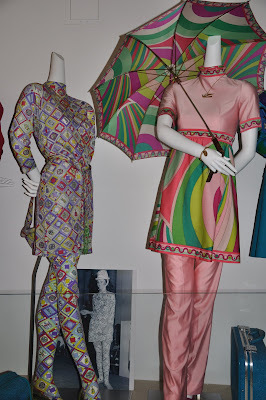 I thought the display of some older flight attendant uniforms was quite interesting. Check out these colorful fashion statements. 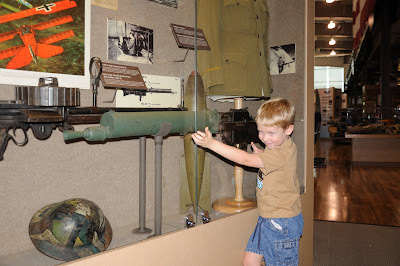 Nicholas liked some of the military exhibits, especially this gun. He got right up next to the glass and pretended to fire it. Boom! Boom! Boom! My sweet little boy must touch everything. Here is a perfectly nice model of a plane. But there are no windows on this plane and it is in reach of my son. My little boy's fingers just can't control themselves. They must stick themselves in the window to see what else they can touch! 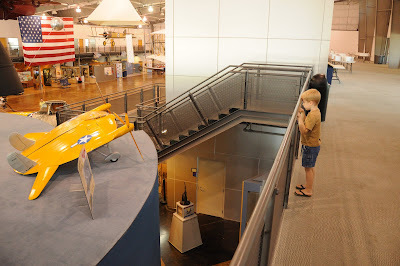 Nicholas liked this little yellow plane model. 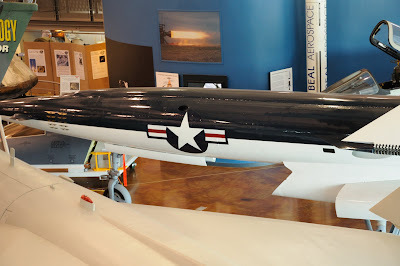 It's a model of a real plane, the Vought V-173, affectionately called the Flying Pancake Plane. 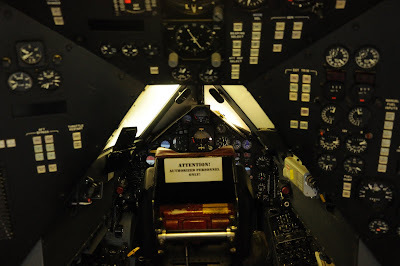 There is only one plane like it and it will be on display at the museum soon. We learned about some of the first hot air balloons. We watched a video about the Hindenburg disaster. 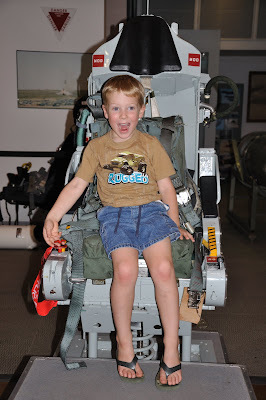 Nicholas got to sit in a rocket powered ejection seat from the F-4 "Phantom". He really wanted to pull the lever to see if he would go shooting up in the air. 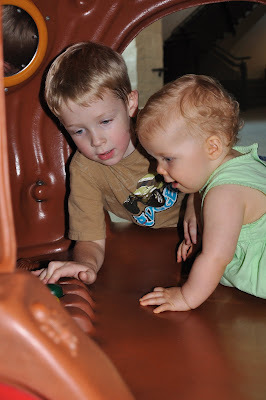 Nicholas was excited to find a kid's play area at the museum. 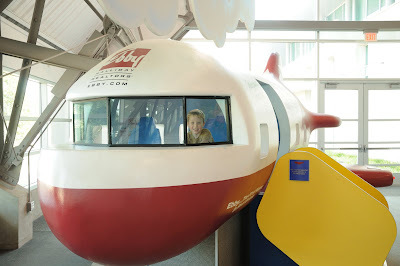 It was really cute with a radio control tower and plane that kids and parents could actually climb in. 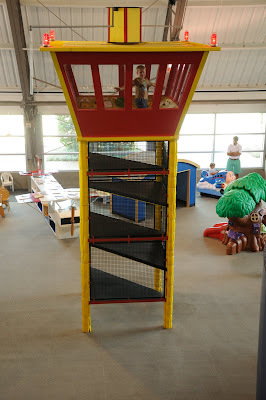 There were also several other play areas, a reading corner, and even a Jay-Jay the Jet Plane theater. 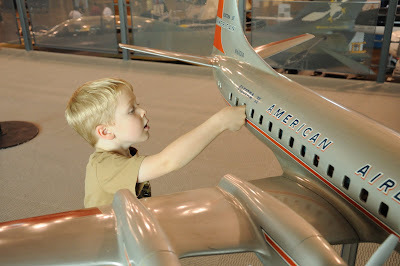 The Frontiers of Flight Museum is a fun outing for children and adults. It's open Monday - Saturday 10am to 5pm and Sunday 1pm to 5pm. They are located at 6911 Lemmon Ave on the southeast corner of Love Field. Adults: $8, Seniors (65+): $6, Youth/Students (3-17): $5, Children under 3 FREE!